You’ve upgraded to a new version of Excel, and realize you’ll be sharing workbooks with people who haven’t upgraded yet. 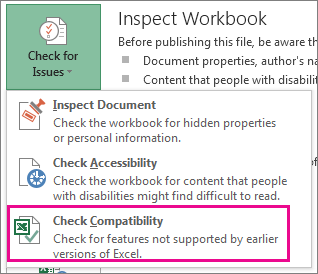 Running the Compatibility Checker can help you identify features or information that might not be available in an earlier version, so you can resolve some of those issues before you share your workbook. Click File > Export > Change File Type. 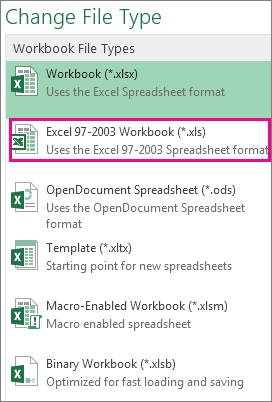 Under Workbook File Types, double-click Excel 97-2003 Workbook (*.xls). In the Save As popup window, choose a folder location for the workbook. In the File name box, type a new file name (or use the one that’s already there). If the Compatibility Checker appears, review any compatibility issues that were found. The Find link takes you to that place in your worksheet, and the Help link takes you to information on the issue and possible solutions. In your new version of Excel, the workbook you just saved in .xls format opens in Compatibility Mode. Keep working in this mode when you plan to send this workbook back and forth to people who open it in the earlier version of Excel. 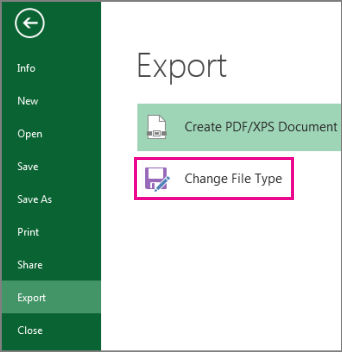 When you no longer need backward compatibility, click File > Info > Convert to convert the workbook to the current file format so you can take advantage of What's new in Excel. 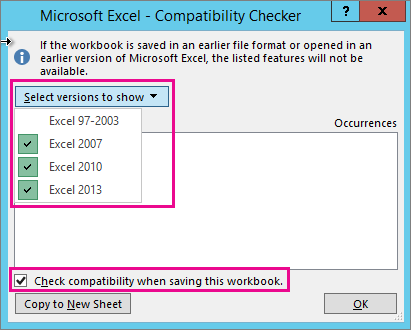 To verify that a workbook is compatible with Excel 2013, 2010, or 2007, run the Compatibility Checker manually the first time you save your workbook. Then set the Compatibility Checker to run automatically every time you save that workbook. Click File > Info > Check for Issues. 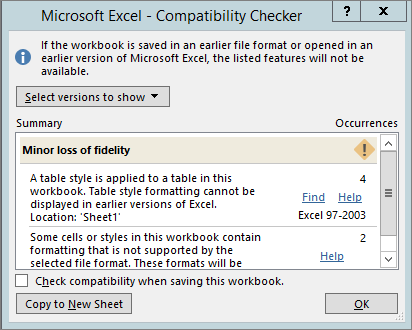 To check for compatibility automatically from now on, check the Check compatibility when saving this workbook box. Tip: You can also specify the versions of Excel that you want to include when you check for compatibility. All versions are checked by default, so just uncheck the versions you don't want to include. If any issues are found, the Find link takes you to that place in your worksheet, and the Help link takes you to information on the issue and possible solutions.